Long queues in many places suggest that turnout will be higher this year than in past municipal elections, when turnout has been less than 50%. Based on reports from our correspondents, most polling stations opened on time at 7 am, but some opened more than two hours late due to missing materials and late allocation of polling station staff. Problems seemed to occur in larger cities - Beira, Maputo, Matola and Quelimane. In smaller towns such as Marrromeu and Sussendenga, some polling stations had not opened by 9 am. In general, queues were longer in the north and centre, with over 200 voters waiting for each polling station at opening time in some places in Nampula city. 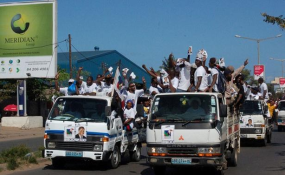 Long queues were noted in Beira, Tete, Quelimane, Gurué, Catandica, Chimoio and other places. In the south, turnout was lower in Gaza and Maputo province. In Matola and Maputo city, turnout was very variable, with long queues at some polling stations and only a handful of people at others.